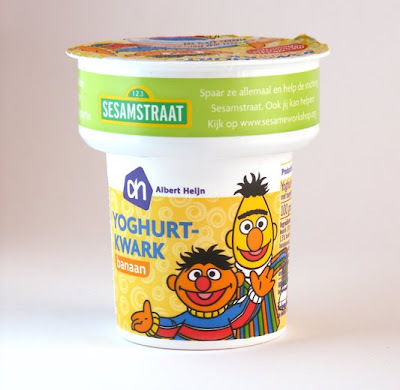 While scouting around the supermarkets I spotted this small yogurt desert which shows the characters from Sesame street. 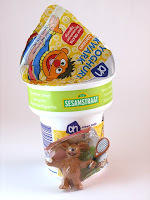 In this small cup there is a free toy figure from one of the characters from Sesame street. I've got Tommy the dog I think, the figure actually is pretty ugly and does not even look close to the real thing. Also the space where the figure sit inside the cup is bigger than the space they really needed. And it's really too little amount of yogurt inside this cup. However for small children it's probably ok and the kid might just go for the toys. However I think they should had put more accent to the graphic design that there is a free toy figure inside. 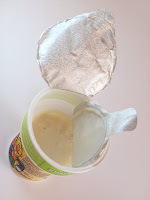 Or they should use a transparent top film so the children would see the toy inside. 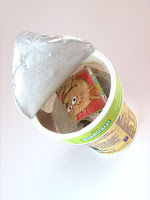 Because from what I could see is that there is a small red square on the top foil where is says "free toy inside". While this is place about eye heights of children's they actually still see the sides and not the top of this cup. And also they are stack upon each other so you wont see that message. They should place it big on the side or look carefully how Kinder Suprise eggs does it.